In 1967, the Filmation-produced Superman/Aquaman Hour of Adventure featured short animated segments with additional DC characters. 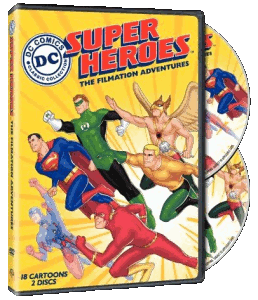 The Superman and Aquaman segments have previously been released on DVD, and the rest are now available as the two-disc set, DC Super-Heroes: The Filmation Adventures. I’ve never seen these before (I grew up on Super Friends), and it’s hard to not compare them to the Bruce Timm-designed Justice League cartoons, which benefit from 30-odd years of advances in animation techniques (and technology) and storytelling — not to mention a decent budget. The stories are simplistic, the villains’ motivations even more so; lots of footage is re-used, and the heroes are flat. But the action tends to be wild and crazy, in keeping with the comics of the time. In fact, a lot of the aspects that stand out when viewing these today are true to the source material. This was deep into the Silver Age at DC, and wild and crazy sci-fi adventure hadn’t yet given way to the more street-level storytelling of the Bronze Age. The excessive narration, while annoying at first, recalls the heavy use of narrative captions to point out exactly what’s going on — how the Flash can run across water, for instance, or reminding us of the name of Hawkman’s mascot Screel (I’m sure I spelled that wrong) even when he calls the bird by name. It also gives the features the feel of a radio play with accompanying visuals. Almost every villain is an alien trying to invade the Earth. There’s the occasional mad scientist or mutated creature, and in two of the Green Lantern stories, an alien trying to invade Oa. 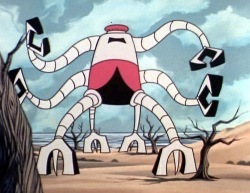 Only one villain from the comics makes the cut: Evil Star, who appears in one of the Green Lantern shorts. The villains are all one-dimensional, but they’re at least differently one-dimensional. They range from pranksters to military commanders (even the ones shaped like beetles) to mustache-twirling megalomaniacs. As far as the video quality is concerned, the shows themselves have been remarkably well-preserved or restored. The opening sequences have fared less well, with plenty of scratches and the occasional problem with the sound. 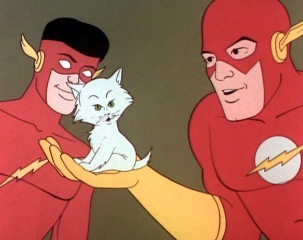 The Flash stars in three segments, and appears in the three Justice League episodes. His civilian ID as Barry Allen is mentioned, but his job as a police scientist is only used as set dressing. (The Atom sequences make the best use of a character’s civilian ID.) Meanwhile, Kid Flash appears in two of the Flash episodes, and the three Teen Titans segments. Wally appears out of costume just once, and the fact that he is Barry’s nephew is not mentioned. The Flash’s costume is simplified somewhat for ease of animation, with a plain belt instead of a lightning zigzag, and yellow gloves instead of lightning cuffs around the wrists. (Though the wings on his cowl are clearly wings, not lightning bolts as they appear in Justice League.) Less explicable is the change to Kid Flash’s costume. It’s fairly simple: they reversed the yellow and red. But it’s hard to imagine why. The Flash episodes feature a wide range of uses for super-speed. He and Kid Flash not only run fast, but vibrate through walls, create vacuums, launch themselves into the sky like helicopters, run up the sides of buildings and across oceans, clear rubble and tie things up at super-speed. In doing so, they fight a mutated giant ant (created by radiation, of course! ), a mad scientist with what we’d now call a mecha suit (and a number of autonomous robots), and an alien speedster who manages to keep one step ahead of them. The Justice League of America segments all involve alien invasions of one sort or another, and all pair up the Flash with the Atom. Despite creative use of his powers in his solo stories, the Flash doesn’t do much more than carry the Atom around in the team-ups. Maybe the cast is too big for the seven-minute length. 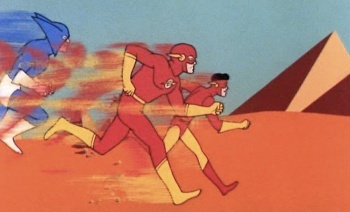 Kid Flash fares better in the Teen Titans episodes, particularly in “Operation Rescue,” in which he breaks his teammates out of a cell, helps Wonder Girl trip a group of attackers with her lasso, and single-handedly protects the T-Copter during takeoff. While the stories are played straight, the villains and situations are also way over the top, making for a great deal of unintentional humor. It would probably be better to watch an episode or two a day, rather than all in one weekend like I did. Still, as I worked my way through the set, there was a sense that anything could happen in the next episode. As groan-inducing as the dialog can be, or the ridiculous situations, it’s hard to deny the fact that these are fun. This entry was posted in Reviews and tagged Animation, DVD, Filmation, Silver Age, Teen Titans, Video on August 24, 2008 by Kelson. I watched these last week and loved them. It was funny to see how all Green Lantern could do was create a fist with his ring. Still, the Flash stories were good even if Kid Flash’s costume was weird. I’m not complaining though. I’m just glad to see these finally make it to DVD, and they were definitely better-drawn than Marvel’s 60’s animation stories with Captain America or Thor. .-= Brian’s latest blog post: What A Way To Go! Deaths in Comics =-. Well, he’s often been portrayed with a preternatural “hawk vision”; in fact he uses it in this week’s issue of ‘Trinity’. And the Silver Hawkman did have a device to imbue him with all the cultural knowledge of all planet. .-= Scipio’s latest blog post: Things That Made Me Happy =-.